Jarrod Saltalamacchia was one of the ten most valuable catchers in baseball in 2013, and he had the best overall year of any free agent backstop. The former first-round draft pick hits free agency with youth on his side. Among catchers, Salty is one of the biggest power threats in the game, ranking fifth with 55 home runs since 2011. He also ranks first in isolated power and third in slugging percentage. He put up a career-best .466 SLG this year, banging out 54 extra-base hits. A switch-hitter, Saltalamacchia hit .294/.350/.523 against righties this year. Saltalamacchia's walk rate continued to rise, as his 9.1% this year was his best since 2008. He hit a career-best .273, and coupled with the walks, his .338 on-base percentage was also his best since '08. Among catchers with at least 400 plate appearances, Saltalamacchia's .804 OPS ranked sixth in all of baseball, even topping Brian McCann. Salty is above average at blocking pitches, according to the RPP stat at FanGraphs. Additionally, his pitch framing skills were worth 23 runs from 2007-11, according to an article by Mike Fast for Baseball Prospectus. He's seen as the leader of the Boston pitching staff, and has their trust. Saltalamacchia doesn't turn 29 years old until May, and is one of only a handful of free agents who will be under 30 in 2014. As agent Jim Munsey pitches Salty on the free agent market, his client's youth is a big asset compared to someone like Carlos Ruiz or A.J. Pierzynski. A switch-hitter, Saltalamacchia struggles mightily against left-handed pitching, with a .206/.269/.338 line since 2011. In his three years with the Red Sox, they benched him against southpaws only in 2012, when Kelly Shoppach was on board for most of the season. It's likely Salty would have batted less against lefties this year had backup David Ross not spent 74 days on the DL. Many players have platoon splits, but Saltalamacchia's is more extreme than other catchers on the free agent market. Saltalamacchia regularly strikes out in 30% of his plate appearances. Among all players with 400 plate appearances in 2013, Salty's 29.6% strikeout rate is the ninth-worst. Of those bottom nine, most hit below .235, and his .273 average does not seem repeatable. From 2011-12, Saltalamacchia hit .228/.288/.452 across 834 plate appearances, a more reasonable expectation moving forward. A .290 OBP is below-average even for a catcher; as a group, they're at .310 this year. Saltalamacchia is below average at throwing out attempting basestealers and preventing them from trying, according to FanGraphs. His caught stealing percentage of 21.2% was second-to-last among qualified catchers this year. Saltalamacchia earned $4.5MM this year, so a qualifying offer would triple his salary. Still, it's likely he'd decline and take his best shot at a multiyear deal elsewhere, even with the loss of leverage from having a draft pick attached. It's easy enough to justify the loss of a draft pick to sign McCann, but less so for Saltalamacchia, especially with Ruiz and Pierzynski as alternatives. Saltalamacchia, who has the longest last name in Major League history at 14 letters, resides in Wellington, Florida with his wife Ashley and daughters Sidney, Hunter Riley, and Sloan. He received the Good Guy Award from Boston writers after the 2012 season, and serves as a Jimmy Fund co-captain as one of his many charitable contributions. Jarrod is extremely involved in charitable work, and truly enjoys it. His hobbies include hunting and fishing, according to the Red Sox media guide. Saltalamacchia was a key figure in the legendary July 2007 trade that also sent Elvis Andrus, Neftali Feliz, and Matt Harrison from the Braves to the Rangers for Mark Teixeira and Ron Mahay. Three years later, he was traded to Boston. 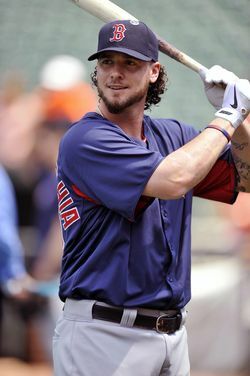 "I don't want to go anywhere else," Saltalamacchia told Nick Cafardo of the Boston Globe in May. Given his familiarity with their pitching and coaching staff, Salty provides extra value for the Red Sox, and it seems likely they'll attempt to retain him. In the organization, the Red Sox have Blake Swihart, who finished at High-A, Christian Vazquez, who spent most of the year at Double-A, and 26-year-old Ryan Lavarnway, who has played at Triple-A in each of the last three seasons and has caught 58 games in the bigs. Lavarnway could be the immediate answer, though he slugged just .350 at Triple-A this year, and the pitching staff might not be thrilled throwing regularly to such an inexperienced catcher. Even if the Sox need to sign a veteran catcher this winter, they seem to have enough depth to limit their offer to Saltalamacchia to three years. In my Carlos Ruiz free agent profile, I mentioned the Red Sox, Phillies, Yankees, Blue Jays, Rangers, and Braves as potential fits. Saltalamacchia's struggles against left-handed pitching could give the Phillies pause, while the "bridge appears quite charred in both directions" regarding a potential return to Texas, according to MLB.com's T.R. Sullivan. It's also hard to picture a return to the Braves, who will probably piece something more affordable together assuming McCann leaves. Though the Jays could look to improve upon J.P. Arencibia, would they replace him with a different high-strikeout, potentially low-OBP catcher like Saltalamacchia, possibly at the expense of their second-round draft pick? The Yankees are a viable landing spot, though perhaps not at four years. The White Sox may be a potential dark horse, with potential platoon partners in-house in the form of Tyler Flowers and Josh Phegley. Free agent alternatives to Saltalamacchia will include McCann, Ruiz, Pierzynski, and Dioner Navarro. The floor on Saltalamacchia is probably three years and $24MM or so. ESPN's Keith Law recently wrote he thinks the market will offer Saltalamacchia a four-year deal, perhaps in the range of $10MM per year. The remaining question is which team would reasonably do so. Though I've yet to identify a club I think will go four years on Saltalamacchia, I agree that he will eventually find it, and I'm predicting a four-year, $36MM deal.